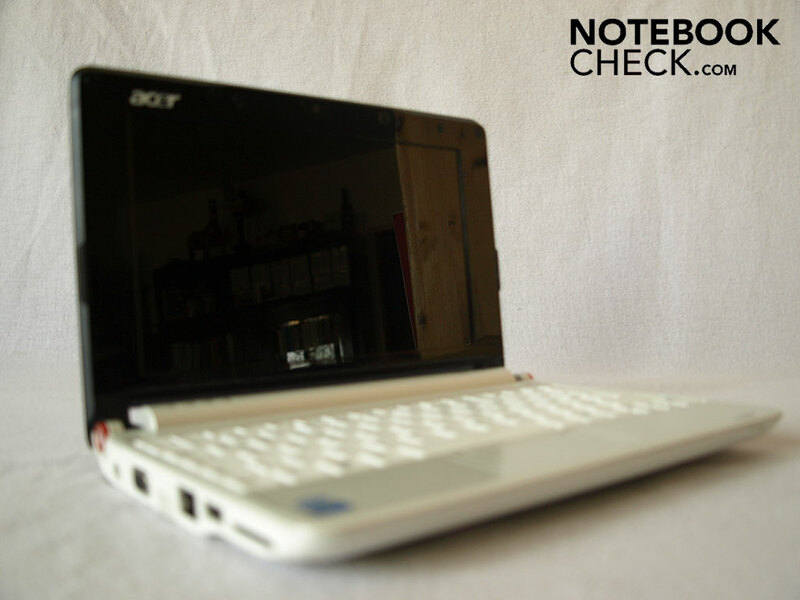 Acer fielded the A110L Netbook last summer. These 8.9" netbooks were originally shipped with Linpus Linux Lite. Later on, devices with XP were offered. 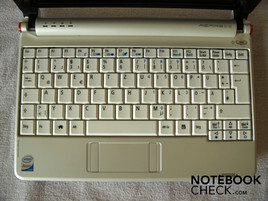 The tested notebook came with pre-installed Linpus Linux, but was tested with Windows XP Home 32-bit as operating system. This review will clarify in how far the AOA110-Aw is in accordance with our criteria and under which circumstances changing to Windows XP is possible. Meanwhile, Acer has released some more Aspire One netbooks. 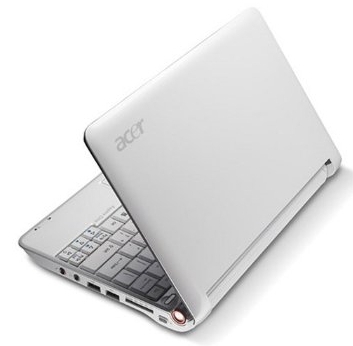 Besides the A150 (L or X), a slightly improved version of the 8.9" netbook featuring a somewhat larger harddisk and an optional UMTS module, Acer now also offers larger models with a 10" display. An example is the Aspire One D150, which we tested recently and which is no longer available with Linux. Regarding the model names of the AOA110-Aw, it can be said that the AOA110-Aw and the A110L have the same part number (LU.S020A.067) and are thus identical; it is distributed in Austria under the former name and in Germany under the latter one. The "A" following the hyphen stands for the Linux version (B would indicate the XP version) and equates to the "L" in the German version. The "w" indicates the color, white in our case. 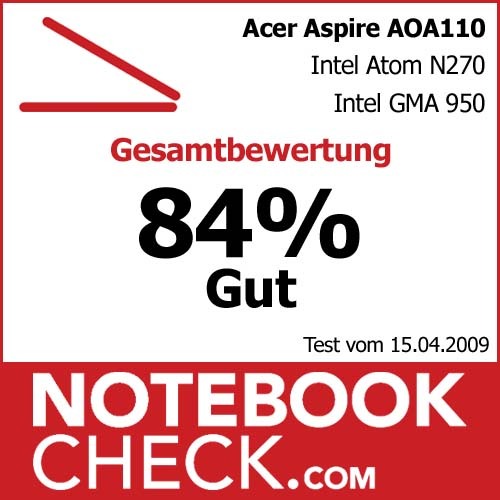 The color variety of the Aspire One; unfortunately, only blue and white are available in Austria. The A110 with its 8.9" form factor fits into a relatively small case of 249mm width, 170mm depth, and 29mm heigth. 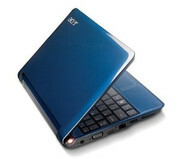 This netbook comes in different colors, of which only two are available in Europe: white and sapphire blue. The tested model features a high gloss white case. 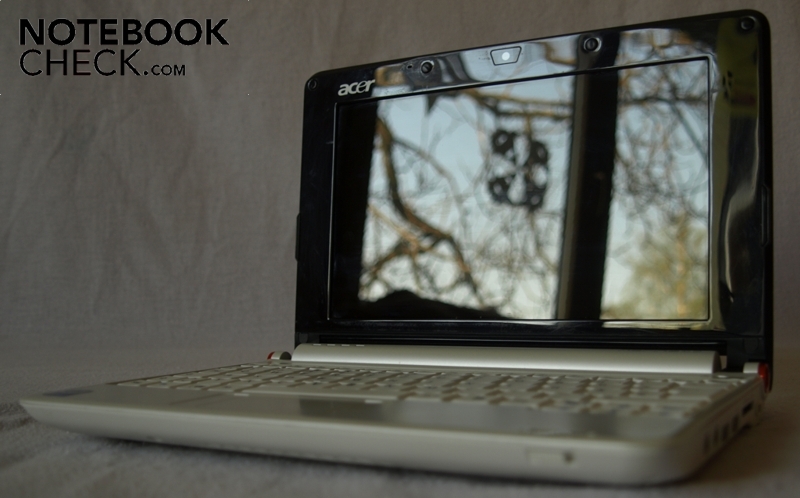 After opening the netbook, a high black gloss frame around the display surprises the user. 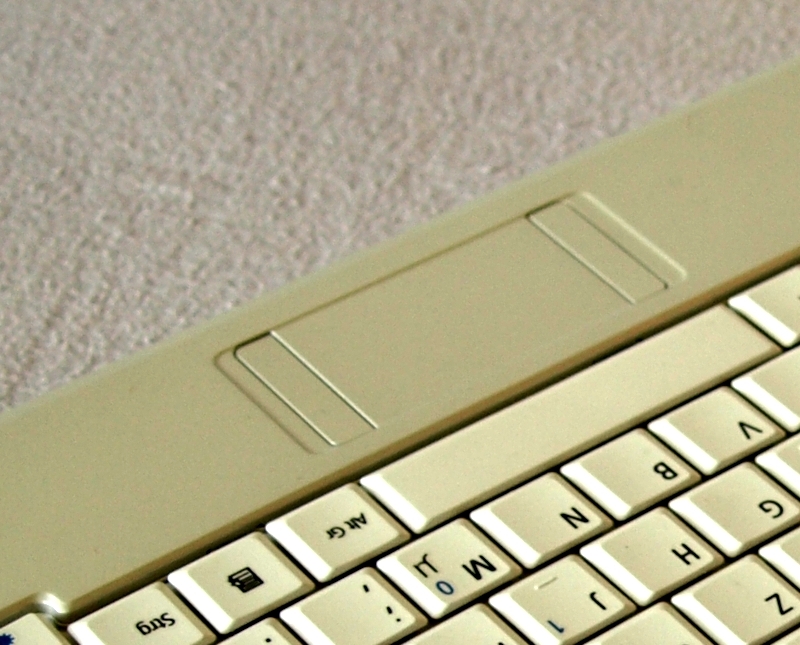 The keyboard and the surrounding surfaces are kept in a high gloss white as well. One quickly finds out that white is hardly sensitive towards finger prints, so only the frame around the display easily shows finger prints. Each touch, e.g. when adjusting the opening angle, leaves marks there. The slick surfaces, especially in the area of the palm rest, do not feel too great haptically. The plastic casing generally features a good stability and torsional stiffness, one can easily lift it up at any corner. The palm rests are weak points, they give in somewhat when pressure is applied. The display's hinges do appear a little small, but they are sufficiently stable. 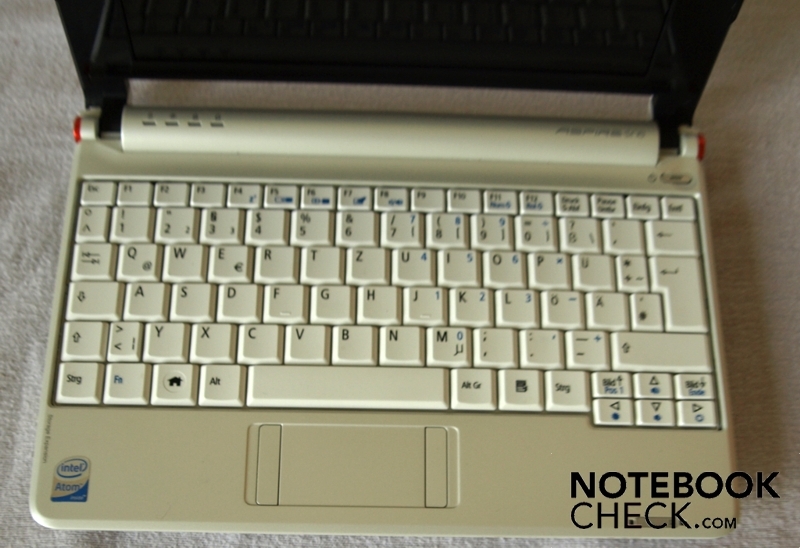 They cannot completely prevent the display from luffing, but they are sluggish enough to prevent an accidental opening of the closed lid, as the netbook does not come with a locking device. One disadvantage of the sluggish hinges is that both hands are necessary for opening the lid. It does come with a netbook sleeve. Speaking about opening the lid: due to the design, the opening angle is limited to about 155 degrees, but that does not bring along any limitations in using it. 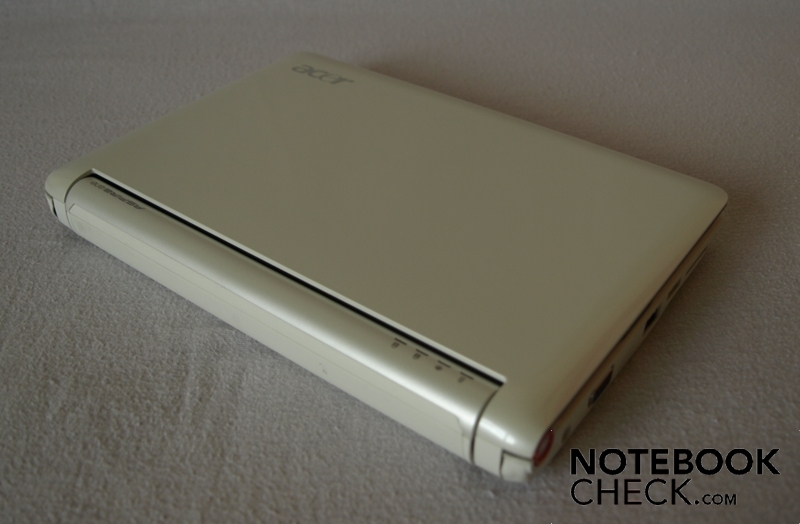 Like the recently tested, newer Aspire One D150, the A110 features exactly those ports a moderately up-to-date netbook should have. They include a VGA-output for connecting an external monitor, a LAN port, a microphone, and a headphone connector, and a total of 3 USB ports. A multi card reader is also included, as well as an additional SD-card reader, which is supposed to extend the meager mass storage capabilities. 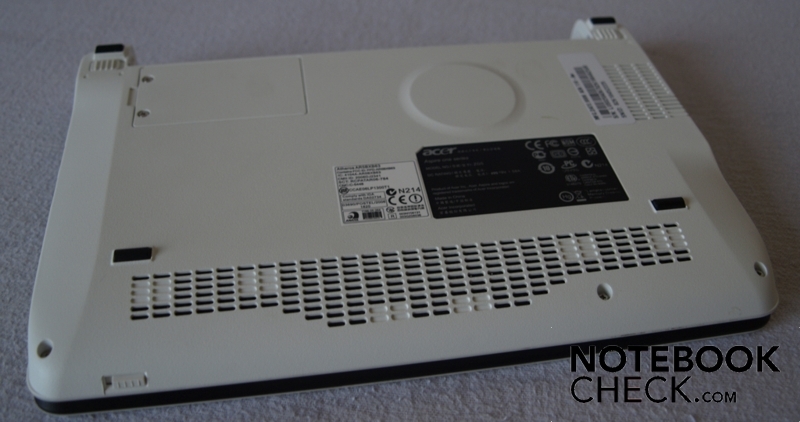 All ports are on the sides of the netbook, since the rear is completely occupied by the battery, and the front edge is rather thin due to the cant, which only leaves space for the WLAN switch. This is quite alright considering the limited available space. Fortunately, those ports which are rather used permanently, like power supply, VGA-output and LAN, are located near the rear end. The Aspire One A110's wired LAN-access is carried out by a Realtek module (Realtek RTL8102E Family PCI-E Fast Ethernet NIC), while the Wireless unit comes from Atheros (Atheros AR5007EG Wireless Network Adapter); it supports the usual Standards 802.11b/g. Neither Bluetooth nor UMTS are available for the A110. Acer is a little tightfisted as far as the granted basic warranty goes: only 12 months carry-in service are given. It does feature an international warranty though, and the warranty can be extended to up to three years. 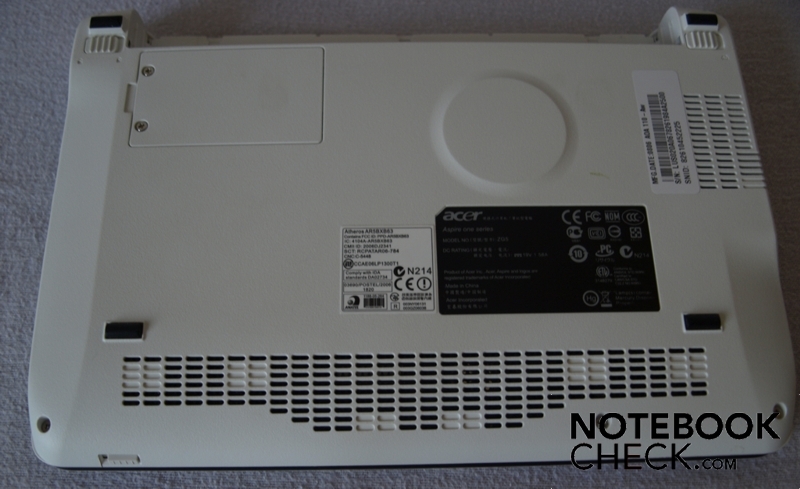 This Acer Advantage Extended Warranty for 36 months for 55 Euros can almost be called a really good bargain. Furthermore, an extended warranty for 24 months of carry-in service is offered at about 35 euros. As mentioned above, the A110L models come with Linpus Linux Lite pre-installed; a recovery CD is also included. An external optical drive is needed to be able to boot from the recovery CD. Alternatively, one can follow the guide included to create a bootable USB flash drive; a computer with an optical drive and an empty USB flash drive are needed for this. Resetting the system to its factory settings is easy afterwards. The tested model was supposed to be used with mobile internet, but lacked the possibility of testing a service provider's configuration with a UMTS modem. Therefore, Windows XP was installed on the system. Using an external UMTS solution from a provider of your choice should be possible without any problems, since they mostly offer support for Windows. Good news first: (1) it is, (contrary to what a salesman from an Austrian electronics discounter said) possible and legal to install Windows XP on an A110L, as long as one owns a legal copy of Windows XP. 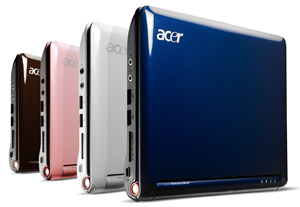 (2) Acer does offer Windows XP drivers and utilities for the A110 on the company's website. After booting from an external optical drive, running Windows went smoothly at first. During the installation, the external drive was not detected anymore after a reboot was necessary, so the installation searched for a Windows XP CD in vain. At that point of time it was impossible to change the boot order to booting from CD via pressing F12 during the boot process, and the BIOS settings were ignored as well. Instead, the system kept booting from hard disk and asked to insert the XP CD - which was impossible due to the external drive used. Unfortunately, the Windows installation routine does not allow for a cancellation in a case like this. Only cutting off the power supply and removing the battery made booting from an external drive and recovering Linpus Linus Lite possible again. After this first unsuccessful attempt, some experiments with a Linux Live CD (Knoppix 6.0) followed. These were promising, and one might conclude that a version of Linux featuring a nice desktop would really go well with this system. Using wireless LAN did not create any problems, but the missing possibility of using UMTS for internet access remained a problem. After the breakdown at trying to install XP for the first time, we figured that it might be reasonable to first copy the XP CD to the local hard disk. We started installing XP a second time ready to copy the XP CD's content to the mass storage space (which XP had already formatted and partitioned) with the help of a Linux Live version, should we experience another failure. But that would not happen; the XP installation went smoothly in the second attempt. Speaking of a Linux Live CD: with the used Knoppix CD, it was easily possible to copy it to a USB flash drive and to boot from there. All one had to do was to transfer the system to the flash drive via Adriane v1.1 (boot options when starting the CD); details are available here (pendrivelinux.com). After first attempts at walking with Knoppix 6.0, one can only assert that it is a pity that Linux systems are not supported by more hardware producers - precisely because of Microsoft's de facto monopoly within the area of personal computer operating systems. Admittedly, Apple MacBooks are available with MacOS, but not wide-spread in the consumer market. 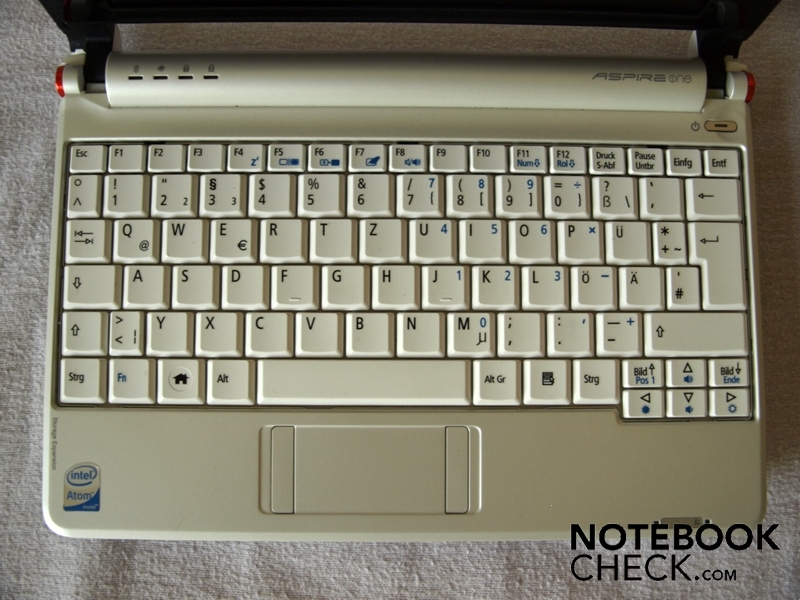 In order to fit a 84-key keyboard into a 8.9" netbook, the keys had to be shrinked a bit. The standard keys, featuring a width of 16 millimeters and a depth of 14 millimeters (effectively: 12 mm by 12 mm, since they are canted on the sides and front), are pretty tiny indeed and are unfit for big hands. The backspace key is especially hard to hit since it is rather short. 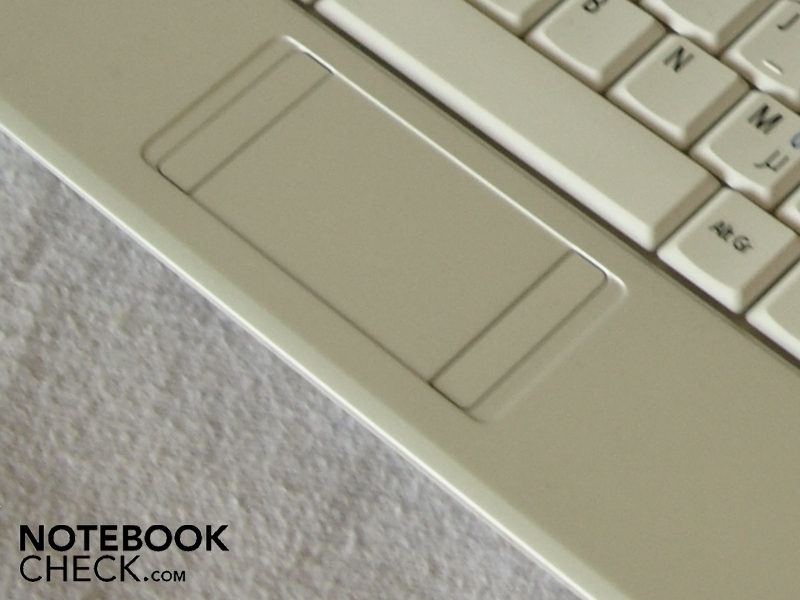 The two-line enter key deserves a praise, especially in such a small netbook. Another advantage of the built-in keyboard is its accordance with common keyboard layout. The feeling when typing is somewhat elastic, because the area of the keyboard gives in a little bit when one types. The keys' resistance to pressure is rather small, but the pressure point is definitely tangible. The producer claims a minimal length of stroke of 1.6 mm; no abnormalities could be found during the test. The used touchpad could not really convince: on the one side, the mobile subsitute for a mouse's surface (also with a high gloss finish) could have been more fit for gliding; on the other side, the touchpad's keys are much too small. It is thus difficult to unerringly hit the two keys which are placed to the left and right of the touchpad. Additionally, the keys do not offer any comfort in typing: they are relatively noisy and sluggish. However, it is possible to navigate across the screen with the mouse's pointer precisely, aside from the occasional getting stuck due to the suboptimal gliding properties. A 0.3 megapixel webcam and a built-in microphone are found at the upper edge of the display, so video conferences are easily possible together with the Aspire One A110's communication equipment. 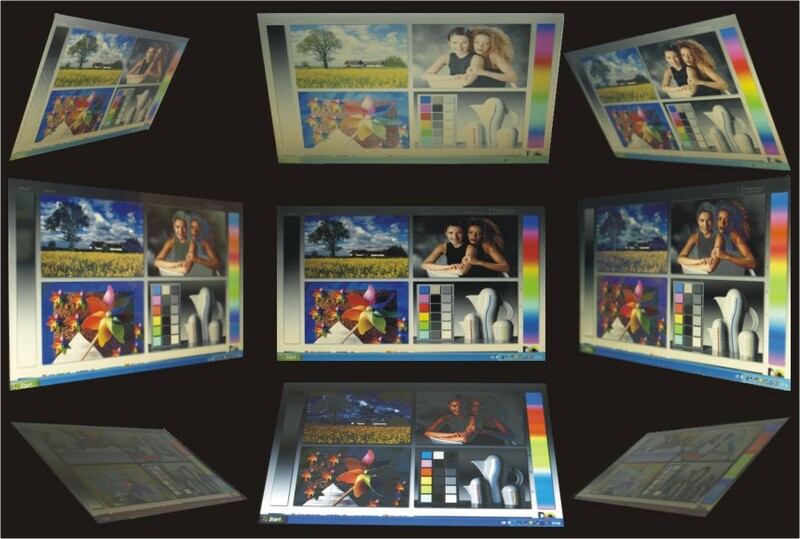 The 8.9" WSVGA display features a resolution of 1024x600 pixel, which is typical of a netbook's desktop. This is sufficient for simple office-applications and for surfing the internet, but one has to adapt to having to scroll frequently, especially vertically. Nowadays, a lot of websites and applications are optimized for the commonly used 1280x800 WXGA format, which partly is hard on netbooks. The manufacturer's data indicates a brightness of 180 nit for the built-in display, which uses LED technology; unfortunately, we could not confirm this information, lacking a measurement device. Subjectively, the display seems to be sufficiently bright and relatively evenly illuminated - only the upper parts seemed to be a bit darker. Black, in contrast, appeared to be somewhat bright. 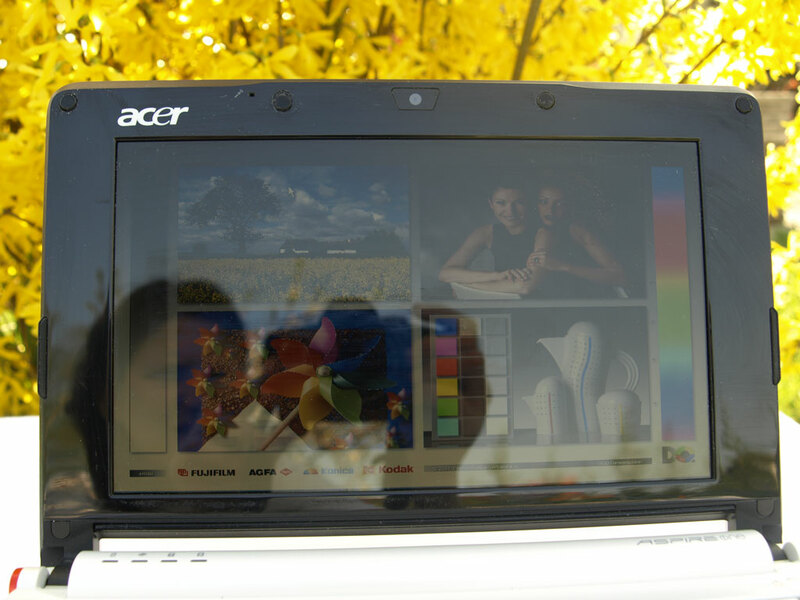 The "Acer CrystalBrite" display's reflecting surface cannot be counted as a strength; in disadvantageous lighting conditions, e.g. outdoors, glaring display surfaces inevitably cause strong reflections. For mobile netbooks which invite to be used outside, this is an essential shortage. The rangeability offered, both horizontally and vertically, is sufficient as far as stability of the angle of view is concerned; however, the stable angle in a vertical direction turns out a little narrower. Changes in the display have to be anticipated when one does not look at the display in the optimal 90 degree angle of view, that is in a vertical way. A flattening of the horizontal angle of view causes increasing reflections. To cut a long story short: the performance is fit for a netbook (as it comes with typical components for one). The CPU used is an Intel Atom N270 chip at 1.60 GHz, 533 MHz FSB and 512 Kb L2 Cache. 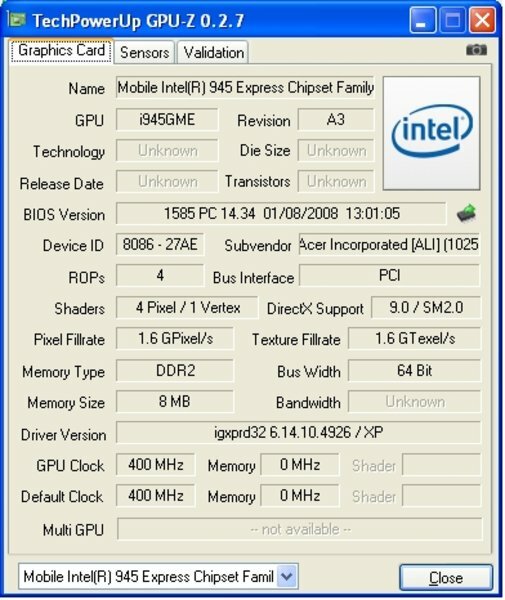 The integrated Intel GMA 950 chip set graphics adapter (which is commonly used in most other netbooks as well) is responsible for needs of graphics. 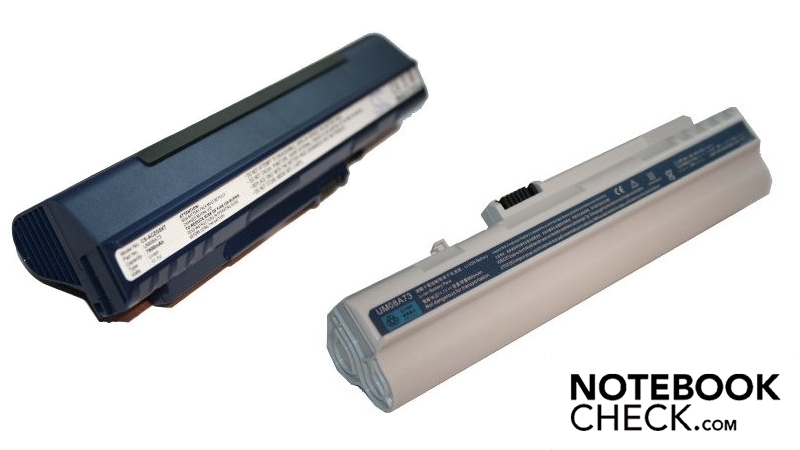 An advantage of this solution is the low power consumption of only up to 7 watt; the chip's cooling load is also very low, which is favorable to a netbook's compact build. 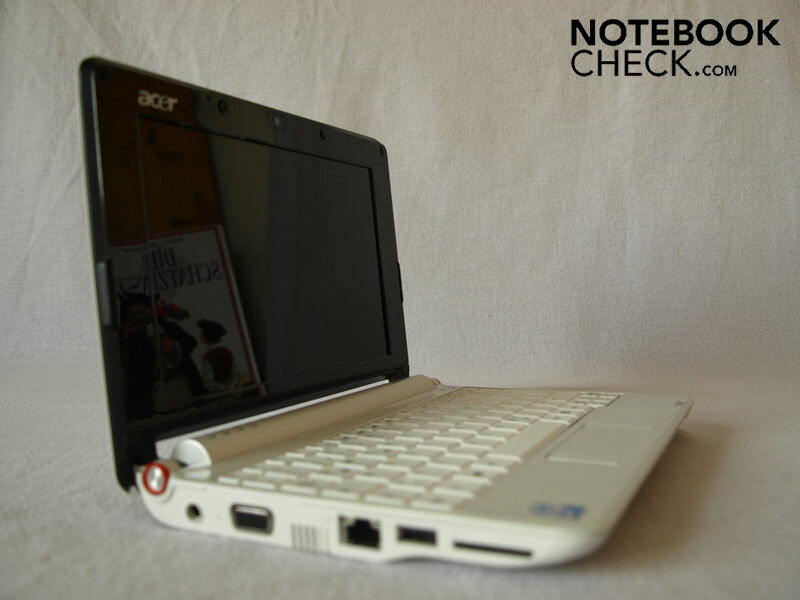 This netbook reached 2886 points in the 3D Mark 2001 benchmark, and 717 points in the 3D Mark 03, which rather depends on the CPU. It can generally be said that 512 Megabyte RAM are definitely a bottleneck, similarily equipped netbooks with a greater RAM capacity have a clear advantage. In conclusion one can say that the performance is sufficient for commonly used applications, as well as for office usage and internet-access - but the user's patience is taxed when applications are started. 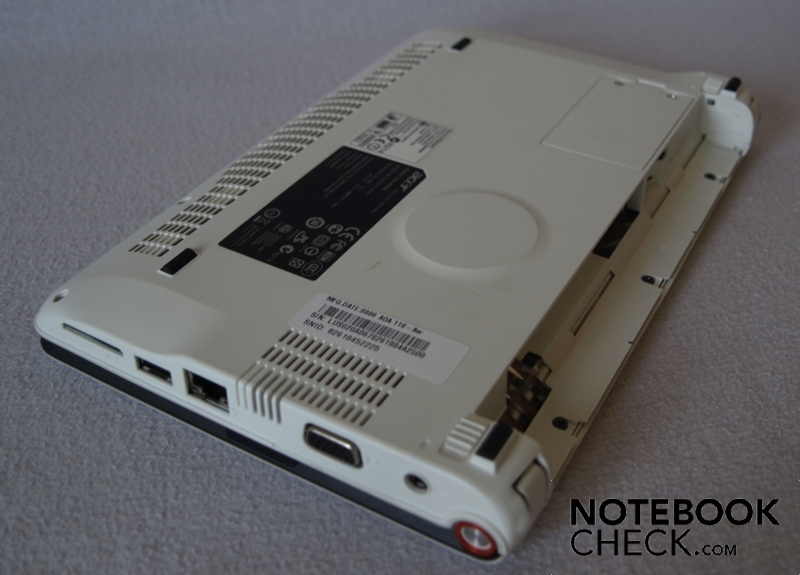 The Acer Aspire One A110 we tested came with 512 MB RAM (one onboard DDR2 533 MHz SDRAM module with 512 MB); the netbook has only one soDIMM slot which supports only 512 MB and 1024 MB bars, limiting the total RAM capacity to 1.5 GB. As mentioned, the small RAM capacity reduces the performance, an upgrade would be highly advisable, especially when using Windows. The netbook was equipped with a Mini-SSD of 8 GB. The P-SSD1800 used in our model reached a comparably low rate in reading of 32.4 MB/s in the HDTune benchmark, while the transfer rate was average for a SSD drive. Eight GB mass storage space really is not a lot, but the netbook offers a simple mass storage space expansion via a SD-card reader designed for this purpose. A further expansion of storage space is possible via USB flash drive. We have to limit ourselves to subjective information in this area as well, since we did not have access to a measuring device. One can nevertheless say that the fan runs continuously and fairly noisily even in idle mode. It is louder under increasing workload, but the soundscape is comparable to a transformer and low-frequency, making it less unpleasant. We did not have access to a measuring device for metering the temperature either, but the temperature subjectively seemed to stay within acceptable limits even under a high workload, the surfaces did not become too hot. On the upper surface, the palm rest became notably warmer, as did the area on the far left side around the vent on the left side. The area on the bottom side around this vent also became notably warmer. The loudspeakers are not particularly worth listening to: on the one hand, they are installed facing down on the canted front edge; on the other hand, the soundscape is tinny and without any bass. Only the maximally available volume is sufficient. The usage of very good headphones is recommendable for really enjoying music. In spite of the fact that the A110 only comes with a 3-cell 22Wh battery by default, it occupies the whole rear side. As expected, the netbook reaches a mediocre battery life of 109 minutes (1 hour 49 minutes) under workload in the BatteryEater Classic Test (max. display brightness, WLAN switched on, max. performance profile). 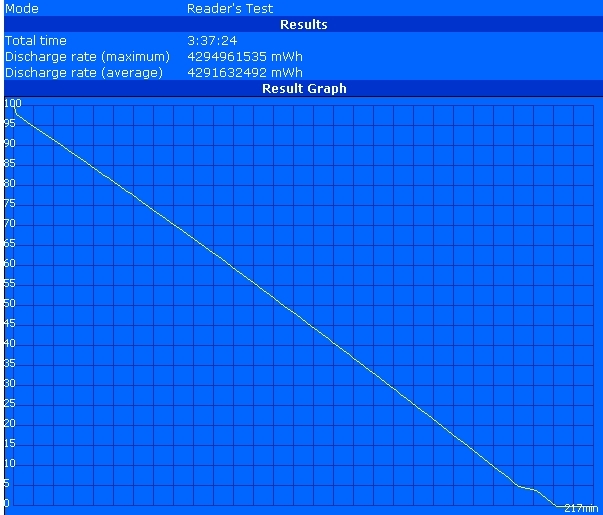 The maximal battery life is also somewhat short for a netbook, tested with BatteryEater Reader's Test (min. display brightness, WLAN switched off, energy saver profile): the netbook reached 217 minutes, which is about 3.5 hours. This value can of course not really be reached under normal circumstances. In practice 117 minutes (almost 2 hours) were reached, using WLAN for surfing the web and using the "maximum performance"-profile; that is merely working about half an hour longer than minimally possible. Reducing performance any further (i.e. 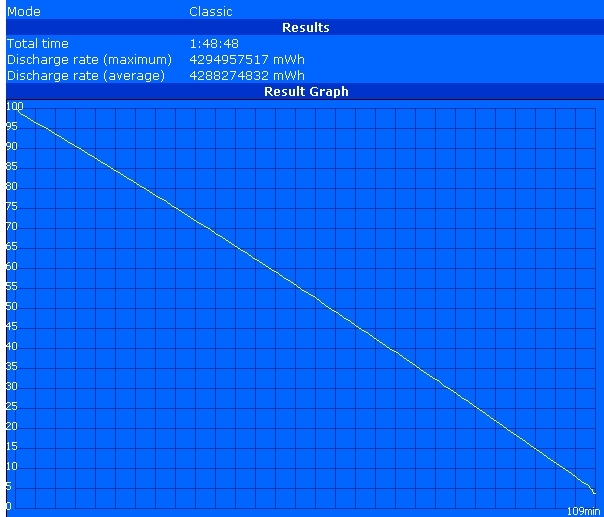 using the "energy saver" profile) is definitely not advisable with this netbook. An Acer 6-cell Li-Ion additional battery with 5.200 mAH (offering about 5.5 hours of battery life, following the producer information) is available for about 70 Euros, if the battery life should not be sufficient for your needs. The Acer Aspire A110 (available in white and blue in Europe) does look quite pleasing, but that is not all. There are generally no flaws as far as stability and torsional stiffness of the case are concerned. This netbook's performance is totally adjusted to its purpose: applications for internet and office for mobile usage. If one has the patience for sometimes longer periods of waiting when starting applications, the netbook (featuring an Intel Atom N270 CPU and an integrated GMA 950 chip set graphics adapter) really is equipped sufficiently. The mass storage, a Solid-State-Disk with 8 GB, is really small, but also quiet and robust (no mechanical parts inside). Only the low RAM capacity of just 512 MB is a real bottleneck. Doubtlessly, a display completely fit for usage outdoors would be desirable for a mobile and compact netbook. Unfortunately, the relatively bright 8.9" WSVGA AcerBrightView Panel display (LED lit) is not recommendable for usage outdoors, since its surface reflects. The battery life of the standard 3-cell battery is somewhat low for an ultra-mobile netbook. The optional 6-cell battery can produce relief. Many thanks to Astrid Osztovits, who kindly placed the tested device at our disposal. Notebook carry case, 12 Months Warranty, Originally shipped with Linpus Linux Lite. XP drivers and utilities available at Acer's homepage. The built-in speaker's sound is not too good. Upgrading the RAM is not easy, since the cover on the bottom does not provide easy access to any system components - it does not even provide access to anything. The low maximum capacity for RAM further reduces the performance, a 512 MB DDR2 RAM Chip is onboard, and a slot can hold either a 512 MB or a 1024 MB bar. Therefore, the maximum capacity is limited to 1.5 GB RAM. As far as the performance is concerned, one can say that the equipment (Intel Atom N270 CPU and Intel GMA950 chip set graphics adapter) is sufficient for standard applications for internet or office. The run duration can be improved to about 5.5 hours with an optional 6-cell battery (available for about 89 Euros). The pretty short run duration of the 3-cell battery provided by default decreases mobility. Despite the fact that the brightness would be sufficient, the A110 is not really suited for outdoor use due to its glaring display. The keyboard is also white, some keys are very small, but the layout is standard. 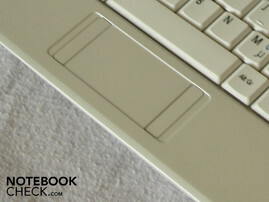 The touchpad's surface also comes with a high gloss finish and does not feel particularly good. ... but only the black frame around the display is sensitive to dust and fingerprints. ... but the opening angle is limited to a maximum of 155 degrees. ... only a blue version is also available in Europe. The temperature emitted is not too high and limited to mainly the left area surrounding the vent (which is running permanently). 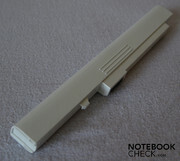 All those things which would have helped a netbook in gaining more mobility: primarily a matt display completely fit for outdoor usage, but also a longer battery life and a built-in UMTS module. How netbooks that do not meet the key criteria for fulfilling their purpose can be so successful anyway.